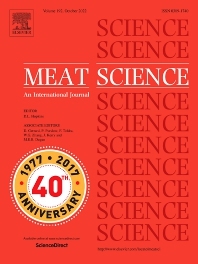 Meat Science has been the leading journal in its’ field now for more than 40 years. The qualities of meat – its composition, nutritional value, wholesomeness and consumer acceptability – are largely determined by the events and conditions encountered by the embryo, the live animal and the postmortem musculature. The control of these qualities, and their further enhancement, are thus dependent on a fuller understanding of the commodity at all stages of its existence – from the initial conception, growth and development of the organism to the time of slaughter and to the ultimate processing, preparation, distribution, cooking and consumption of its meat. It is the purpose of Meat Science to provide an appropriate medium for the dissemination of interdisciplinary and international knowledge on all the factors which influence the properties of meat. The journal is predominantly concerned with the flesh of mammals; however, contributions on poultry will only be considered, if they demonstrate that they would increase the overall understanding of the relationship between the nature of muscle and the quality of the meat which muscles become post mortem. Papers on large birds (e.g. emus, ostriches) and wild capture mammals and crocodiles will be considered.